Not so long ago we reviewed Guadajalara’s ratings as a green city according to a study from 2010 and provided updates on some of the improvements it had made since then. You may recall that we mentioned that at some point in 2008, Guadalajara counted a free, public bicycle-lending system called Pedalea Guadalajara (Pedal Guadalajara) among its local transportation options. It was apparently complete with bike stations at various locations throughout the city (especially around the center) but it had since disappeared, for what reason we know not. Well, as we also mentioned back then, as of last year Guadalajara once again offers a public bicycle-sharing system, although this time it’s not free. Named MiBici (MyBike), much more has gone into it than ever went into Pedalea Guadalajara and it promises to stick around for some time. 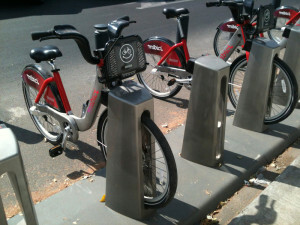 Indeed, you may have already noticed installations all over the city or people using the red, silver, and black bicycles. If you’re curious as to how the system works, you’re in the right place. Here’s everything you need to know about it to describe it to someone else or use it yourself. 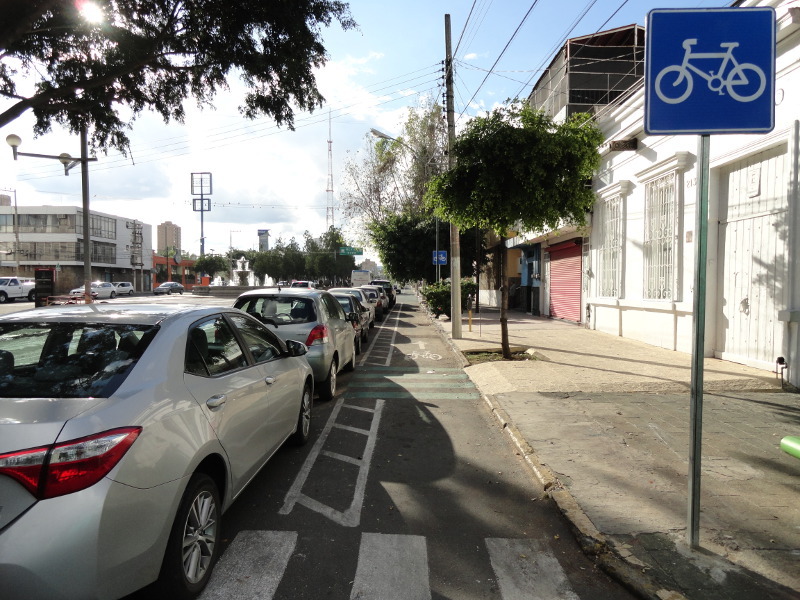 By now you’ve probably noticed the painted bicycle lanes, intersection waiting areas and priority signs with pictures of bicycles among other things on streets like Avenida México and Avenida de la Paz. 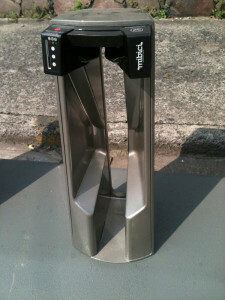 It’s no coincidence that those things were finished as the MiBici stations went in. Part and parcel of the MiBici program was an attempt by the city to beef up the biking “infrastructure” around town. While any and all improvements are welcome, we feel that much more is needed before Guadalajara becomes a truly safe place to bike. That will require a change in the city’s culture, though. Nevertheless, any attempts at improving safety are welcome, and certainly the situation is better than it was when we last wrote our guide on biking in Guadalajara. At any rate, any street within the vicinity of a MiBici bicycle station should have at least some of the new safety markings and signage we’ve mentioned above. Currently, the system is comprised of 116 solar-powered stations with 1,160 bicycles in the central areas of Guadalajara and Zapopan. The system has seen one expansion thus far and may see more over time. First off, you’ll need to be old enough to use the system: 18 years of age if you’re going to subscribe on your own, or 16 years of age with a guardian. Whoever is in charge of the account (you or your guardian) will need a valid credit card (no AMEX) or debit card. Each credit card can be used for up to two memberships at once. Have an identification document with ID#, such as a passport, handy. An address in Guadalajara where you can receive your system welcome kit including key card (only if you sign up for the annual subscription), although you can also register at MiBici’s central office in person if you prefer or a temporary pass can be purchased through any station’s kiosk – more on all this below. There are two membership types to choose from in order to be able to use the system. You can either opt for an annual subscription, in which case you pay $365 MXN ($1 MXN per day – then Mayor Ramiro Hernández García really wanted it to be cheap for the end user), or you can elect to purchase a temporary pass for 1 ($80 MXN), 3 ($160 MXN), or 7 days ($280 MXN). Obviously, if you plan to use the system even somewhat regularly over a longer period of time, the annual subscription is a much better deal. Membership is not transferrable and they do not want nor recommend that you allow someone else to use your membership. Keep in mind that if you allow someone to do so and they mess up a bike, it’s on you. For the annual pass, you must register online or in person at MiBici’s central office where you can complete the form with the assistance of MiBici employees if you require it. The registration form online is in Spanish but the process is fairly straightforward. However, if you just don’t do Spanish and you still want to sign up, consider asking a Spanish-speaking friend to help you with the process or visit the central office – with any luck they’ll have personnel who speak English and can walk you through the process. While registering, you will be asked to select a type of warranty based on the cost of a bicycle, the form of payment (credit or debit card) for any additional charges you incur using the system and you’ll be given a chance to redeem any gift certificates you may be in possession of. Moreover, you will be asked to preauthorize a charge of up to $5,000 MXN for any damage a bike suffers while under your care. With your annual subscription comes an ID# that is assigned to you and a welcome kit with a key card (referred to simply as a llave, or key in English) that enables you to check bikes out at any of the stations around town. The welcome kit is sent via bike messenger to the mailing address (your home address here in Guadalajara) that you specify when you register online. You can also opt to pick up your welcome kit at MiBici’s central office instead (you’ll specify how you want to receive the kit when registering). If you choose to receive the welcome kit at a home address, you will need to be present when it is delivered as the messenger will need to verify your identity (have identification ready – a Mexican national ID if you have it or your passport) and have you sign your contract. Your key card will then be activated for you. If instead you choose to pick up your welcome kit at the central office, you’ll need to bring the payment card you registered with online, identification (Mexican national ID or passport) and you’ll have to sign your contract once you’re there. Then, your key card will be activated. The annual subscription with key card permits you to the use of one bicycle at a time. In order to have two bicycles at your disposal, apply for a new annual subscription via the website or at the central office. Your key card is meant to be yours only and is non-transferable. It will cost $70 MXN to replace a missing or damaged key card, which will be charged to the payment card on file, so take good care of it. To acquire one of the temporary passes, visit the kiosk of any MiBici station around town and use the touchscreen to order and purchase your pass, which is effective immediately. On the home screen, select “RENTAR”, choose your subscription period, pick whether you will be renting 1 or 2 bicycles, slide your payment card and wait while your payment is being authorized. You will have to approve the subscription fees and usage charges, as well as a hold of $1,200 MXN per bike for any damages the bike suffers while in your care (if nothing happens to the bicycle, this hold is released 7 business days after your rental period ends). You will also need to enter your telephone number, postal code and sign a digital contract agreeing to the terms and conditions. In the case that you have a gift certificate, you can redeem it at the kiosk as soon as your credit card is validated. You will be given a receipt with a 5-digit code that enables you to check bikes out right away (well actually, about 5 minutes after you conclude the registration process at the kiosk). This code is personal to you and your account and should not be shared with anyone. Similarly, your temporary pass and use of the system are non-transferable. They ask that you contact them immediately in case of accident and they will subsequently send someone out to the site of the accident to assess the situation, help determine responsibility, value the damages and assist the parties involved in reaching an agreement. In the case of theft of a bike you’ve checked out, again, contact MiBici immediately using one of the methods listed above. They will send someone to the site to assess the situation and assist you in filing a report with the local authorities. During the subscription period, a bike can used for an unlimited number of trips of up to 30 minutes in duration. After 30 minutes, though, additional charges apply. For instance, in one day, you can use MiBici bicycles an unlimited number of times, so long as each time you check that particular bike back in before 30 minutes is up and wait 5 minutes until you rent the next one. In that way, you can leapfrog your way, bike by bike, a longer distance, so long as you return one before your 30 minutes expires and wait 5 minutes until you grab the next one. Trip times do not accumulate. Also remember that your free 30 minutes start right away, the instant a bike is liberated from its security gate. With the key card, walk right up to your bike of choice, insert the card in that bicycle’s security gate, and wait for the gate to release the bike for use. For those of you temporary pass holders, enter the code you’ve been given using the small keypad, again on a particular bike’s security gate, to remove the bicycle. 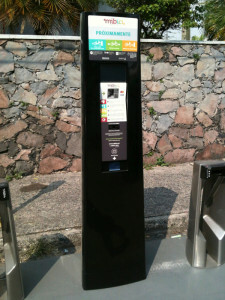 To return a bicycle no matter what subscription option you have, return the bike to the station closest to your destination with an open storage slot, push the front of the bike into the security gate, and await the yellow, then green light on the indicator panel which confirms that the bicycle is locked in and secure. The security gate will also emit a sound upon correct insertion of the front of the bike. If instead the front of the bike is improperly inserted into the security gate, a red light will show and a longer sound will be emitted. This is your signal to try again. Should you be certain that you’re doing it right but you just can’t seem to get that green light indicating that the bicycle is secure, you may need to try a different security gate altogether. It’s your responsibility to ensure that the bike has been properly secured at a particular station – be sure to do so and avoid extra charges. If you are doing your best to return a bike within the initial “free” 30 minutes of your trip but the station you have just arrived at to return the bike is full (there are no empty security gates), you can use that station’s kiosk to request an additional 10 minutes of time, free of charge, in order to ride the bike to another station and return it there. Keep in mind that stations have been installed such that you should be able to find another one within 3 blocks in any given direction. All stations are set to release bicycles between the hours of 6am and 12am, and to receive them at any hour. Put another way, from 12am-6am you cannot rent bicycles but you can return them if you already have one checked out. You can check out a bike in Zapopan and return it in Guadalajara, or vice versa. This map shows the location of all stations. Zoom out to see stations in Guadalajara and Zapopan. 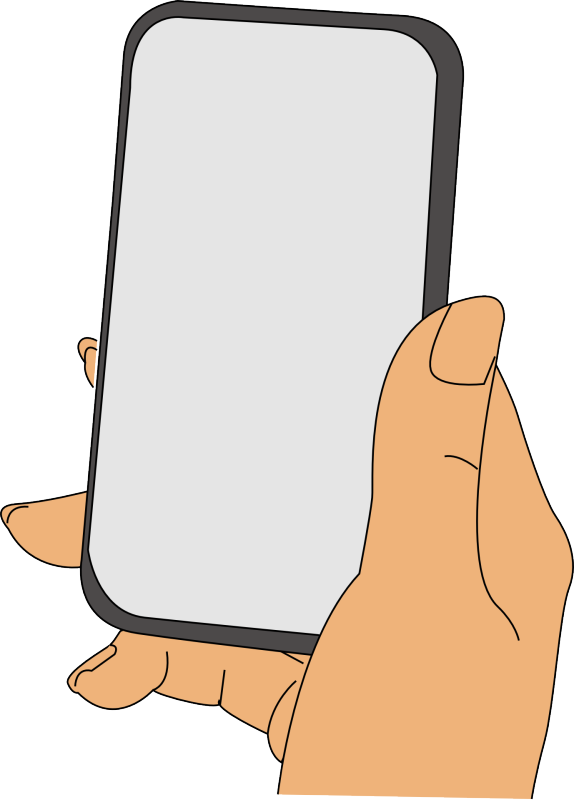 There’s even an app you can download for iOS or Android devices to assist you in using the system. 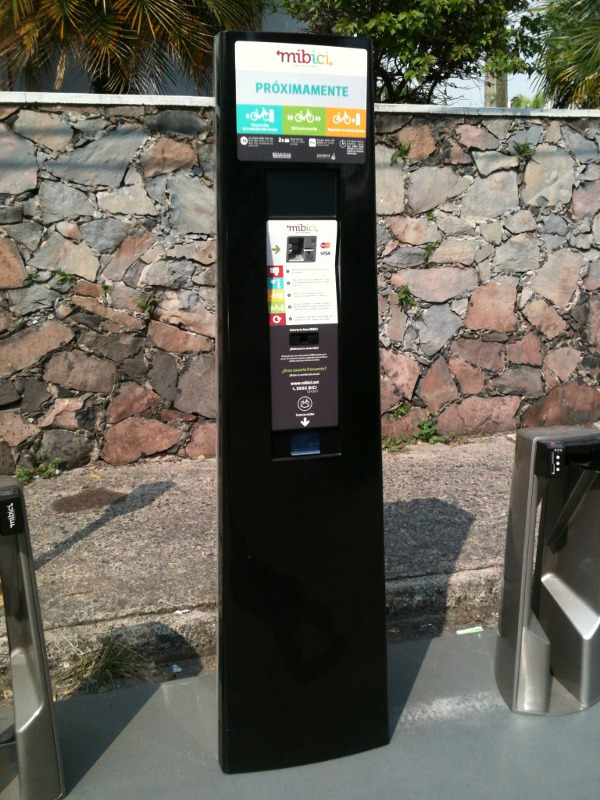 Features include a display of station locations, stations with open gates available to leave your bicycle, stations with available bikes, and so on. 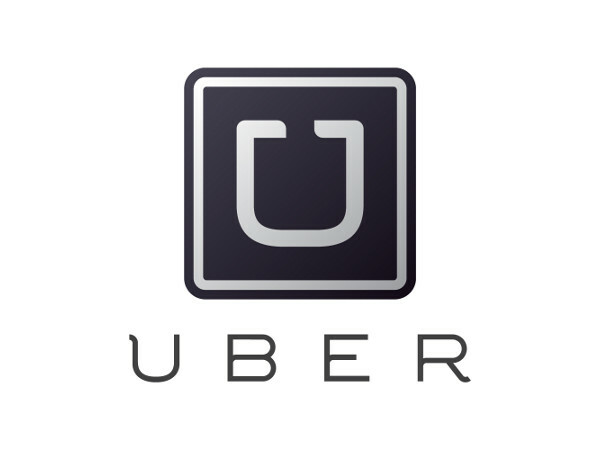 Trips of more than 30 minutes in length carry additional charges. Starting at 31 minutes up to 60 minutes (the second half hour), the charge is an extra $20 MXN. For the third half hour (minutes 61 through 90), you’ll pay an extra $30 MXN on top of the former charge. 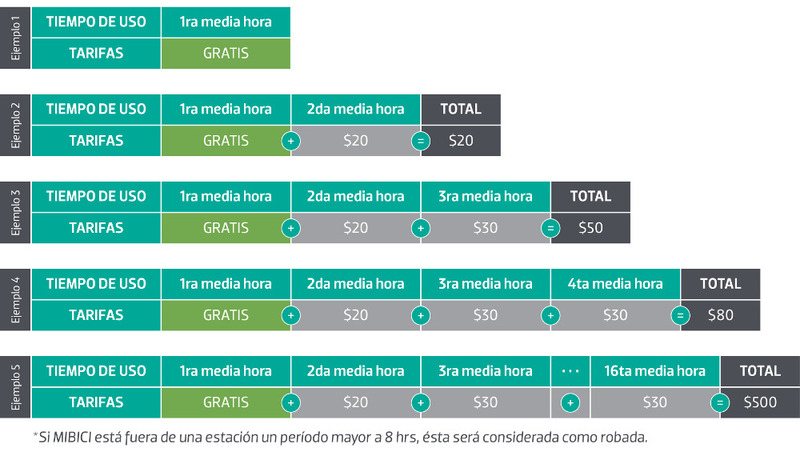 After that, the charges level out and every additional half-hour block will run you $30 MXN extra. See the infographic below for trip examples and corresponding charges (prices are in $MXN). Please note that The Guadalajara Reporter has reported that permitted trip times have been increased from 30 minutes to 45 minutes, but we could not confirm this separately as of yet. The MiBici website continues to show the following infographic. Improper use of the bicyce that results in damage to the bicycle. Damage to, or loss of, a bicycle due to an accident for which you are at fault. Keeping a bike for more than 8 hours. Take note that MiBici will consider this the same as theft of the bicycle in question! In all of the above cases, the credit or debit card associated with the account will be charged directly. As a form of security against damages to or theft of the bicycle, you will be asked to preauthorize a charge of up to $5,000 MXN with the annual subscription and a hold on your payment card of $1,200 with the purchase of any temporary pass. If you sign up for an annual subscription and you lose your key card somewhere along the way, notify MiBici immediately at usuarios@mibici.net. They will respond via email regarding next steps, including temporarily disactivating your card so that no one else who may be in possession of it can use it illegitimately (much like a credit card). If it is clear that the card has permanently been lost (alas, it’s not hiding somewhere in your apartment), you can replace it for the cost of $70 MXN. Pick up your new card at the central office or pay $30 MXN more to have it delivered to you via bike messenger. Sometimes we all need to change the payment card we have on file. In that case, if you initially signed up with a credit card, you can switch to a different credit card, while if you signed up with a debit card, you can switch to a different debit card. You cannot, however, switch from a credit card to a debit card midstream, or vice versa. To make the change, visit customer service at MiBici’s central office with the new payment card so that they can change the information on file for you. There you have it. We feel that MiBici is an excellent option for getting out there and seeing the city, but please do review our article on biking safety and activities in Guadalajara first and be careful out there!